its doors. A year later, it opened them up again — sort of. Deciding animation was worth releasing if not producing, it farmed out production of new cartoons, using old characters, to the upstart DePatie-Freleng Studio (Pink Panther, The Ant & the Aardvark), which was leasing Warner's own former facilities. When DePatie-Freleng moved out, in 1967, Warner took the production back in-house — but at drastically reduced budgets. Since only the most formula-driven series, such as Speedy Gonzales and Road Runner, could manage within the cash restraints, they hired director Alex Lovy, a long-time veteran of the industry who had most recently worked at Hanna-Barbera's mass-production cartoon factory, to come up with a couple of new ones that would work in the new environment. Lovy came up with Merlin the Magic Mouse (a traveling show biz guy who sounded like a poor imitation of W.C. Fields) and Cool Cat. 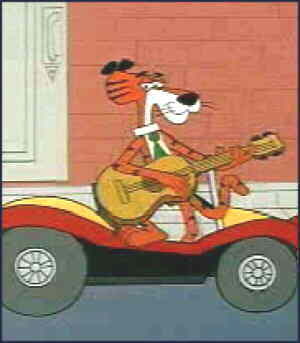 Cool was a tiger with the speech patterns of a beatnik. He was introduced in a cartoon bearing his name, which Lovy directed, and which came out on October 14, 1967. He was the intended prey of big game hunter Colonel Rimfire (who, when he first spotted Cool, echoed Tweety Bird's line, "I tawt I taw a puddy tat! "), a sustainable if rather familiar formula. Lovy left the studio the following year and was succeeded by Robert McKimson, who had worked for Warner back in its glory days, on such characters as Foghorn Leghorn and Sylvester Pussycat's "giant mouse". McKimson dropped Rimfire to pit Cool against such foes as a persistent bee and a tribe of Indians. Cool's voice was provided by character actor Larry Storch, who got his start in voice work with the poorly-received TV version of Koko the Clown. Later, Storch played Tom Dracula on Groovie Goolies. But that wasn't quite the end of him. Decades later, when Warner was turning its old short cartoon stars into new half-hour TV stars, Cool Cat made many cameos in Sylvester & Tweety Mysteries, as anything from a hood ornament to a picture on the wall. Col. Rimfire, too, turned up in some episodes as an actual character, as did the hitherto-unseen Mrs. Rimfire. Cool and the colonel were most recently seen in the direct-to-video feature Tweety's High Flying Adventure, which came out on September 12, 2000. Text ©2003-09 Donald D. Markstein. Art © Warner Bros.